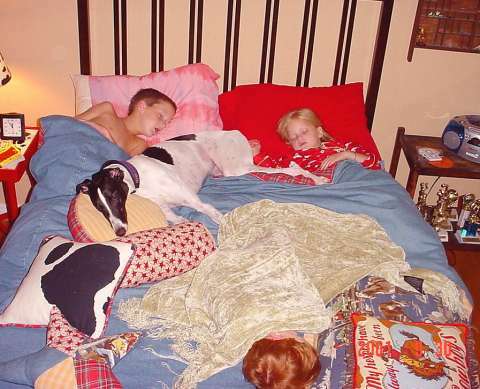 Greyhounds and children really do get along. On the left is Keaton Yeatts (8), on the right is Emma Yeatts (5) and at the foot of the bed, in the middle, is Hutson Yeatts (2) and of course "Meg-a-Boo" or as the two year old calls her "Nutmeg". Photo courtesy of Shana Yeatts (with many thanks). © Copyright 2000 - 2010 Greyhound Rescue Society of Texas, Inc.